The entry was carefully researched from all angles and adhered closest to the requirements of the competition brief. The urban structures of Haparanda and Tornio were fluently extended on both sides, with the landscaped parkland in between having been meticulously designed. The entry was divided into three elements which were helpful for analysing the entry: “the Loop”, which emphasised the internal connections within the site, “the Productive Boulevard”, which creates cohesion within the urban structure, and “the Park” between the two cities. Presenting connections and traffic along a circular route is a good idea as, in addition to visual and structural cohesion, this also creates pedestrian and bicycle routes with varied views. The new blocks included in the entry in Haparanda and Tornio are correctly scaled in relation to the respective structures of both cities. The gradual modification of the block structure from a closed block to a more open structure closer to the shoreline is a rewarding solution. The blocks bordering the E4 in Haparanda are bigger, while going south and closer to the existing building stock they gradually become smaller. The volume of building is realistic within the context and the phasing plan is also feasible. The new blocks house functions that will give each block a distinct character. The focus on the Haparanda side is on the public open spaces within the blocks, where the authors have proposed sports facilities. 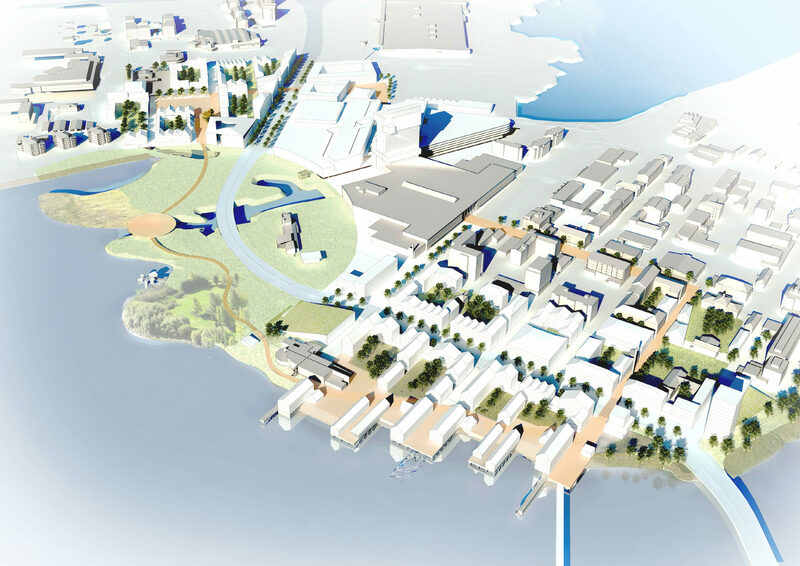 In Tornio, the focal point for the newbuilds is in the well-executed urban shoreline, which links the centre of Tornio to the sea and where suitable port operations have been proposed. In the jury’s opinion, the entry was particularly successful in transforming highway E4 into a street, which is an effective way of controlling traffic and inviting motorists to stop off. 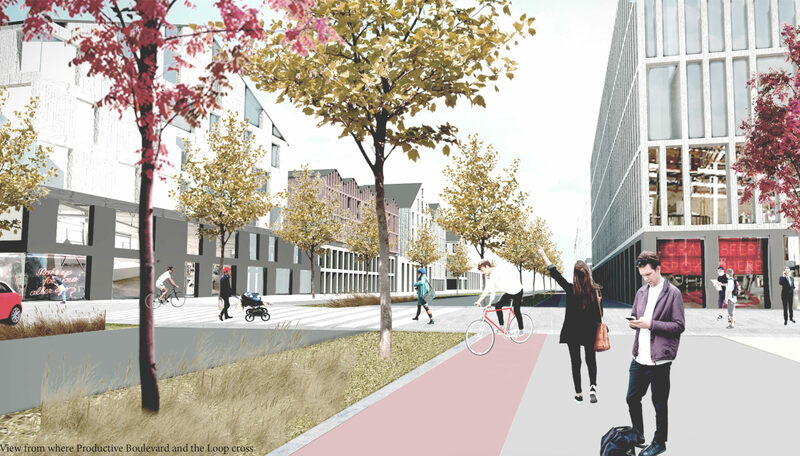 The surroundings of the E4 are made more urban by extending the city blocks right to the edge of the highway, which also helps link the urban structure to the less formal shoreline. The buildings along the highway could house functions under the theme of the Productive City, which would also shelter the buildings and urban spaces behind. Removing roundabouts benefits the landscape, as traffic can be expected to slow down when a highway is turned into a narrower boulevard lined with houses and trees. Possible congestion can be prevented by good signage directing motorists to points of interest and car parks. The E4 sequence – city, park, city – creates interest for motorists, as it helps perception and may attract a passer-by to stop and have a closer look at the place. The architecture for the site was presented schematically but accurately. The eaves-heights, rooflines and roof orientation form a firm basis for planning but give building designers enough latitude. The circular line of the Rajakaari pedestrian and bicycle lane was continued above water, which leaves room for further development, such as a piece of environmental or light art, but the main tenets of the entry will not suffer if this idea cannot be carried out due to cost factors. The entry was so realistic that it was found perhaps a little lacking in a certain flight of fancy that was present in some of the more conceptual entries. However, the proposal is convincingly comprehensive and workable, and subtly supports the unique branding of the twin city. The Twin City TornioHaparanda with its open border is a unique statement in the time of global conflict and rising nationalism. It represents the Nordic spirit and acts as a gateway to the Arctic. The proposed urban scheme ‘Two Cities One Heart’ aims to support this unique unity, creating one active heart for the twin city. The proposed dense urban structure creates shelter in the arctic climate, while catering for a variety of activities and functions. 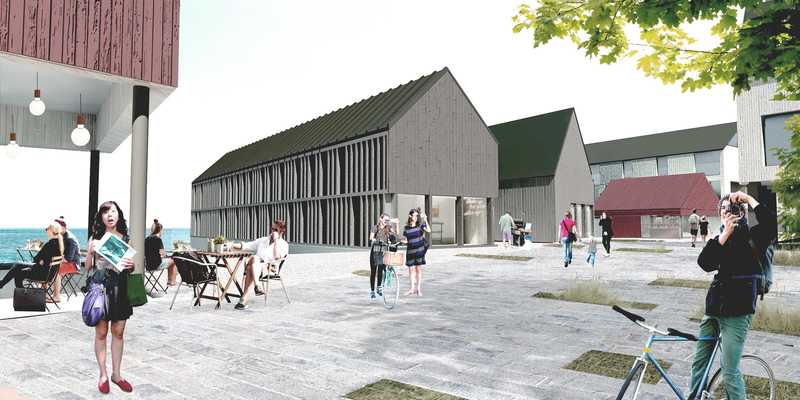 The proposal places emphasis in the use of locally sourced materials to produce high-quality construction and urban spaces that define the atmosphere of the area. 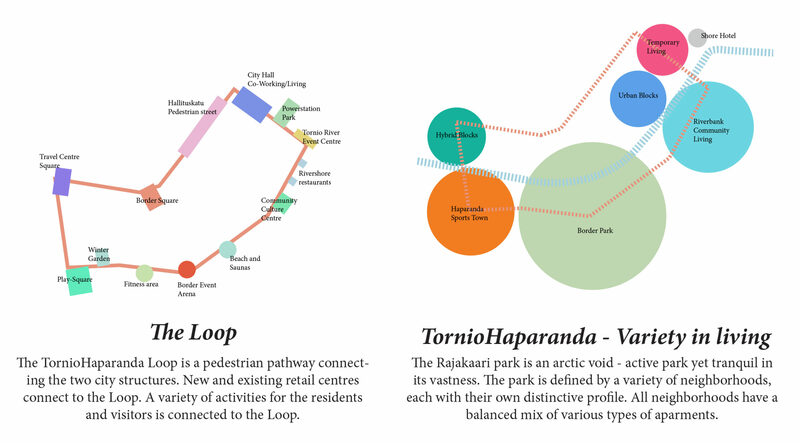 The twin city is further activated with three distinct interventions: the Loop, the Boulevard and the Rajapuisto Park. 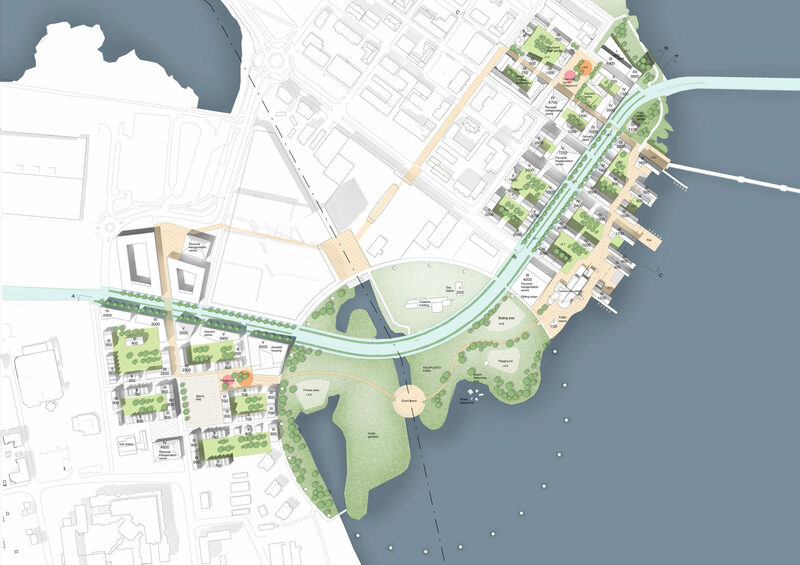 In this proposal, the urban fabric on each side of the border is stitched together with a distinctive route, the TornioHaparanda Loop, where commerce, production and recreation meet. New and existing retail centres, as well as a variety of activities for the residents and visitors are all connected to this new pedestrian pathway, which spans all the way through the city fabrics, the Rajala-På Gränsen and Barents Centres, the river shore and the Rajapuisto park. Secondly, the route E4 is truly transformed into a connecting artery – a productive boulevard that feeds the region. Where passing through the urban fabric, the route is presented as an urban street – a boulevard with ample space for pedestrians and cyclists. The two ground floors of the blocks lining the Boulevard are treated as flexible raw space that is suitable for small scale production, such as breweries or craft shops, as well as office space. This barrier of production spaces also protects the living environment from the traffic noise of the boulevard. Finally, the Rajapuisto park remains an arctic void defined by the urban structure – treated as an active park yet tranquil in its vastness. The park is outlined by a variety of neighborhoods, each with their own distinctive profile and a balanced mix of various types of apartments. The round shape of the park is further reflected in the circular lighting installation that stretches into the Tornionjoki river, representing the concept of circular economy that is materialized in the other intervetions of the proposal. When combined, the presented interventions create intriguing opportunities for commerce, production and tourism alike. From two cities separated by the border…… to a twin city with one heart! Yes, this is it ! Finally Tornio city grows to the riverbanks. E4 route should have bypass somewhere else.